Head west to the Texas Hill Country, an expansive landscape filled with rolling hills, twisting rivers and a look back into the history and charisma of Texas. Whether you&apos;re seeking a river to tube or an antique store to browse, there are plenty of worthy day trips outside of the capital city. Destination: Dripping Springs This bite-size town, located 23 miles west of Austin, is a popular destination for those looking to get a taste of Texas&apos; organic beauty. Swimming hole Hamilton Pool is perfect for cooling off and enjoying the beauty of the natural grotto. Don&apos;t miss the local wine trail, including Bell Springs, Westcave Cellars Winery, Solaro Estate Winery and Hawk&apos;s Shadow Winery. Destination: Johnson City Continue west down Route 290 and you&apos;ll land in President Lyndon Johnson&apos;s birth town, population 1,656. Head over to Pedernales Falls State Park and take a stroll around the area&apos;s long, flat waterfall or dip in the swimming area. Destination: Fredericksburg Drive another 56 miles west on Route 290 and enter this quaint town of around 10,000. Founded by German settlers in 1846, Fredericksburg still features Old World charm while being quintessentially Texan. Be sure to browse antique shops such as D&apos;Vinely Designed or Berkman Books or take a drive to Enchanted Rock, a 640-acre granite hill that travelers of all abilities can hike. Destination: Luckenbach The last time a census was performed in the town of Luckenbach, located just 10 miles southeast of Fredericksburg, the population was three. Visit the town&apos;s two remaining buildings, The Luckenbach General Store and the Luckenbach Dance Hall for daily live music from local and traveling acts. Destination: Boerne Continue down Ranch Road 1376 for 29 miles, and visit Boerne, a nature lover&apos;s paradise. Check out the Cibolo Nature Center for hiking and bird-watching in a preserved marshland or Enchanted Springs Ranch to see exotic animals. 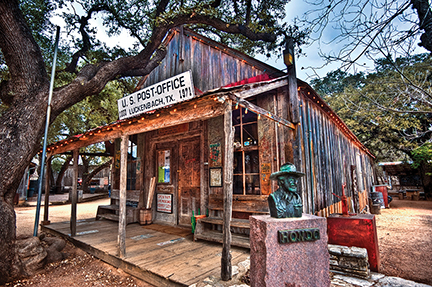 Destination: Wimberley Located 14 miles due south of Dripping Springs, this former mill town produced lumber, molasses and cotton. What remains now is a lovely, antiquated hub for Hill Country arts, boutiques and outdoor adventures. Swim at the crystalline Blue Hole and Jacob&apos;s Well or take day hikes through the scenic Cypress Creek Trail and Mount Baldy. Destination: Kyle Just 20 miles south of Austin, Kyle is home to a local farm, craft and arts market every second Saturday of the month; a popular city pool and free movies at the lake. Head to the Central Texas Speedway and race around the Go Kart track or catch a concert, fair or festival. Nearby, the San Marcos Premium Outlets offer huge savings on name brands like Prada and J. Crew. Destination: New Braunfels Head 25 miles south from Wimberley to New Braunfels, a German settlement much like Fredericksburg. Tube in the city&apos;s two major rivers, the Guadalupe and the Comal, or swim at the family-owned water park Schlitterbahn, one of the largest of its kind in the world. Destination: Gruene Within New Braunfels is the tiny town of Gruene, famous for being the home of Texas&apos; oldest dance hall, Gruene Hall. Destination: Lockhart Located 35 miles northeast of New Braunfels is Lockhart, known as the BBQ Capital of Texas. Eat at world-famous pits: Black&apos;s Barbecue, Smittys Market, Chisholm Trail BBQ and Kreuz Market. Destination: Georgetown Head north from Austin for 30 miles and you&apos;ll enter Georgetown, the home of Southwestern University. Play at the array of golf courses, spas, shops and outdoor adventures. Destination: Marble Falls Located 40 miles west of Georgetown, Marble Falls is nestled on Lake Marble Falls. Rent paddle boards and kayaks at Go Paddle Down. For couples looking to get away, Flat Creek Estate offers tastings and dinner on a beautiful 80-acre ranch, and the Marble Falls Massage Therapy Center features singles and couples spa packages.